Q. I always look forward to giving and receiving plants of the holiday season. 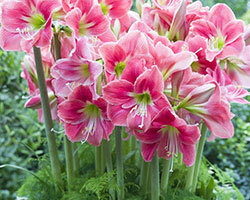 One plant I would like to keep year-round is the amaryllis. Please explain how to do this. Q. I am looking for a colorful companion to some early-spring flowering bulbs. A friend suggested the low-growing anemone. 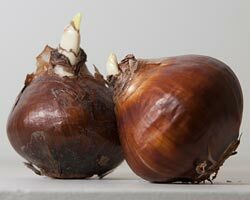 Q. I would like to grow some unusual bulbs in containers this summer. What are the basic guidelines to ensure good growth? Q. What is the correct fertilizer to use for bulbs? Q. I bought several small pots of flowering dwarf iris, crocus and mini-daffodils from the grocery store in February. What do I do with them after they flower? Q. 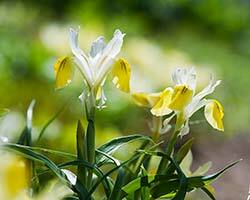 For the best spring flower display, when should I fertilize my tulip and daffodil bulbs? 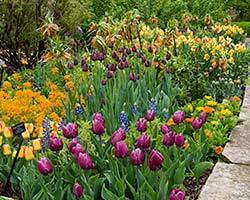 Q. I would like to plant varieties of tulips and daffodils this fall in addition to smaller bulbs. Any suggestions for planting techniques? 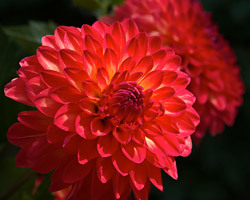 Q. I added quite a few dahlias to my garden this year and they bloomed beautifully. Please advise on winter care. Q. I am fascinated by the use of flowers in preparing certain food dishes. Are there some basic guidelines to follow when choosing the flowers? Q: I have some tulip and daffodil bulbs left over from fall planting. How do I "force" them for indoor bloom? Q. What are the small, round, black growths on my lilies? Read more about Lily "seeds"
Q. I have many varieties of Narcissus in my garden and some are not blooming as well as they used to. What can I do to help? Q. I have ordered several hundred tulip bulbs for fall planting. Can I be assured of their return for many years? Q. Help! I never got around to planting my tulip bulbs this autumn. Is there anything I can do to save them? Q. How and when should I divide my spring-blooming bulbs? 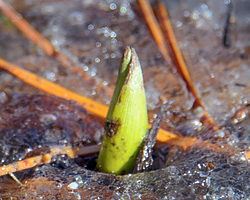 Q: How do I protect my spring blooming bulbs from wildlife? A: Squirrels, chipmunks, mice, and voles can wreak havoc on bulb beds. These animals prefer crocus and tulip bulbs, but will often dig and discard others. To discourage wildlife from digging and eating bulbs, place chicken wire over the planting area. Wire can be laid an inch or two below the soil surface or laid across the planting bed. Use large gauge wire for larger sized bulbs and smaller gauge wire for smaller bulbs.